Learning/volunteer abroad programmes provide opportunities for cross-cultural understanding, partnership-building, and cooperative development, but there are also significant structural challenges and inequality of opportunity issues that result from these partnerships between host organizations in the Global South and learning/volunteer abroad for development (LVA4D) participants from the Global North. Learning and Volunteering Abroad for Development aims to unpack the complex benefits and disadvantages of learning/volunteer abroad programmes, using insights from the volunteers who travel abroad and the communities who host them. 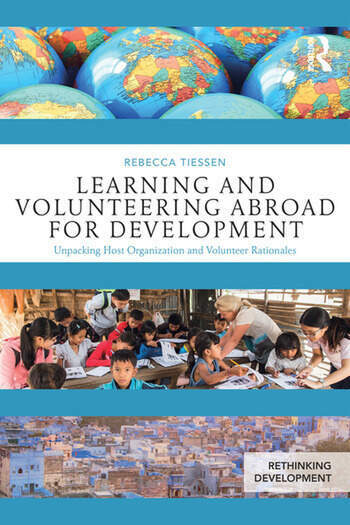 Based on empirical research within both volunteer and host communities, this book provides students and scholars with an alternative framework for a more careful and nuanced analysis of international volunteering programmes, highlighting ways to improve critical reflection, development outcomes, and intercultural competence. Supported by a website with additional learning resources, this book is an integral resource for senior undergraduate and graduate students interested in going abroad, as well as for scholars or development professionals who are leading or researching such programmes. Rebecca Tiessen is Associate Professor, School of International Development and Global Studies, University of Ottawa, Canada.